Hando Nahkur came to Dallas Website Design with a very old and dated website that was not mobile friendly and had functionality that no longer worked. We settled on redesigning and redeveloping the website with a modern look and feel. The website was developed in the WordPress Content Management System, and we incorporated a number of modifications to make it very easy for the Client to add to and update. We then optimized the pages and coding to make the website load quickly and rank well in Search Engines. 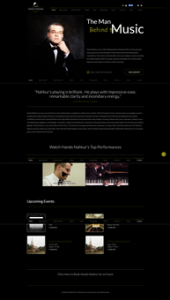 The end result is that Hando Nahkur now has a world class website that better represents and showcases his talent and will serve him well far into the future.